EB GUIDE Studio lets you deliver the most advanced human machine interfaces (HMIs) to your customers. You can offer the features they want and still stay on budget with EB GUIDE Studio, a powerful tool for intelligent multimodal HMI product development. This scalable solution supports automotive head units, heads-up displays, and cluster instruments, as well as HMIs for industrial applications. 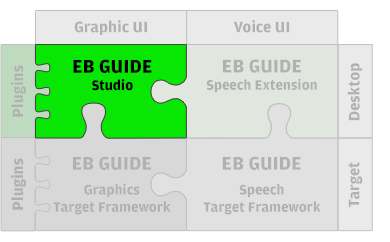 Use EB GUIDE Studio to simultaneously design the graphical user interface (GUI) and voice user interface (VUI), as well as touch and gesture procedures. Use the same platform to create complete HMI solutions for different carmakers, models, and brands—each with its own look and feel. Your whole team, even if it is large and globally distributed, can work on the same HMI model, allowing you to shorten development time and ensure the HMI benefits from everyone’s expertise. Deliver app-like content even to cars already on the road using HTML 5 and the cloud.